Plenty of space for your family vacation! Discover all the comforts of home in our ultramodern Northwoods “Cabin 4” at Loon’s Nest Resort in Park Rapids. 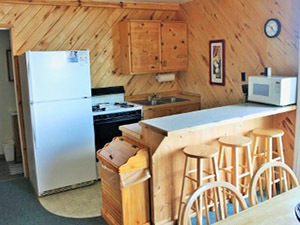 This three-bedroom, one-bath housekeeping cabin on the lake, provides a fully-equipped kitchen with fridge, microwave, cooking utensils, coffee maker and toaster. 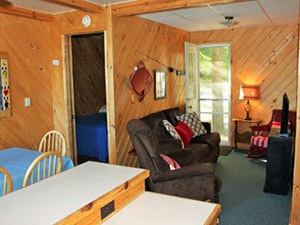 Along with cable TV and a breakfast bar, the cabin includes one queen-size bed, two double beds. The bathroom has a shower only. 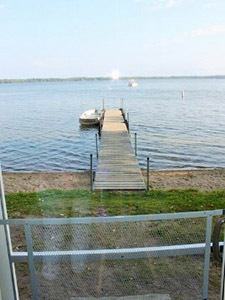 You’ll wake up to a beautiful sunrise overlooking Fish Hook Lake with loons calling right outside your front door. This Minnesota cabin offers charming decor, with finished natural knotty aspen wood throughout for a warm, homey feel. Rates based on 8, sleeps 8 max.